Brushett, Stella May Age 89, of Sherbrooke and formerly of Port Hillford, passed away in St. Mary’s Memorial Hospital, Sherbrooke, on Sunday, March 31, 2019. Born in Norman’s Cove, NFLD, she was a daughter of the late Leander and Eliza (Stockley) Peach. Stella moved, with her husband, to Port Hillford in 1946. 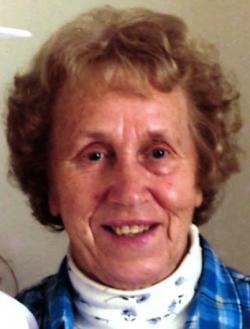 She loved knitting, gardening, flowers and socializing. She is survived by sisters, Mondella (Ross) Conrad, Barbara (Geoff) Hill, 1 niece and 6 nephews. Stella was predeceased by her husband, Ernest; infant daughter, Mary Mondella; brother, Charles Peach; sisters, Margaret "Peggy" (Herbert) Squires, Leah Peach. Visitation will be held Friday from 1 p.m. until time of funeral service at 2 p.m. in St. John’s United Church, Sherbrooke, with Rev. Derek Elsworth officiating. Interment in Cherry Hill Cemetery, Port Hillford. In lieu of flowers, memorial donations may be made to St. Mary’s Memorial Hospital, Sherbrooke. Funeral arrangements are under the dignified and compassionate care of G.W. Giffin Funeral Home, St. Mary’s Chapel, Sherbrooke. On-line condolences may be made at www.gwgiffin.com. 1 p.m. until time of funeral service at 2 p.m.